The man on the Clapham Omnibus is one of those phrases you hear from time to time and perhaps wonder why Clapham and why omnibus. Basically this “man” (or nowadays “person”) is used by English courts where it is necessary to decide whether someone has acted in the way that a reasonable person would. The person on the Clapham omnibus is a reasonably educated and intelligent but nondescript person, against whom the conduct of the defendant can be measured. The phrase was first reportedly put to legal use in a reported judgment by Sir Richard Henn Collins MR in a 1903 English Court of Appeal libel case, McQuire v. Western Morning News. But he attributed it to Lord Bowen, said to have coined it in 1871 as junior counsel defending the Tichborne Claimant case (a Victorian cause celebre about the missing heir to the Tichborne baronetcy) . It may have derived from the phrase “Public opinion … is the opinion of the bald-headed man at the back of the omnibus,” used by the 19th century journalist Walter Bagehot to describe the normal man of London. But why Clapham? Presumably because Clapham was seen as a typical suburb which could represent “ordinary” London. And why Omnibus? It is now rather an archaic expression for a public bus, but was in more common use then. But a bus is a place where you find a random selection of strangers, and perhaps it does not have the connotations that “the man in the Clapham pub” might have! So there you have it. Now when I lived in Clapham I went to work by bus. Conveniently the 88 bus went from the end of the street where I lived and stopped immediately outside my office. 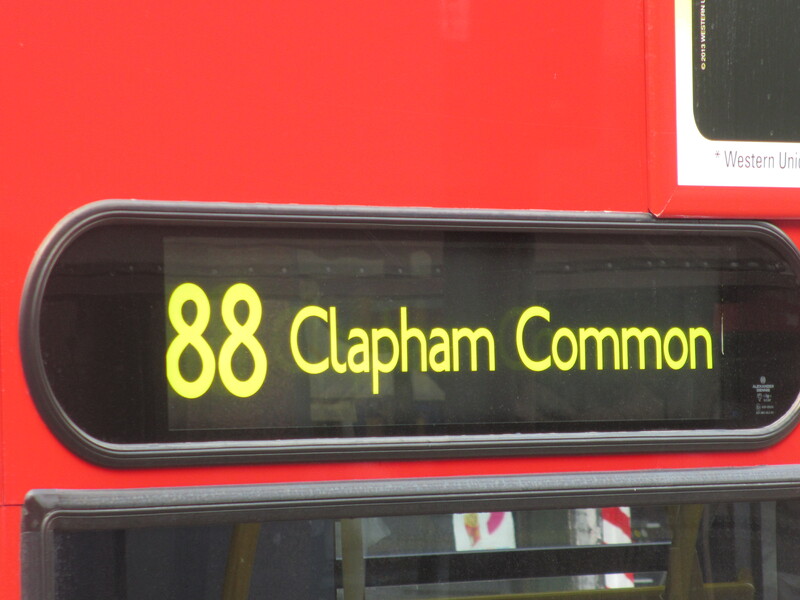 So the Clapham Omnibus will for me always be the 88, and I am the reasonable man on it, although even now not bald and I hope I am not too nondescript! 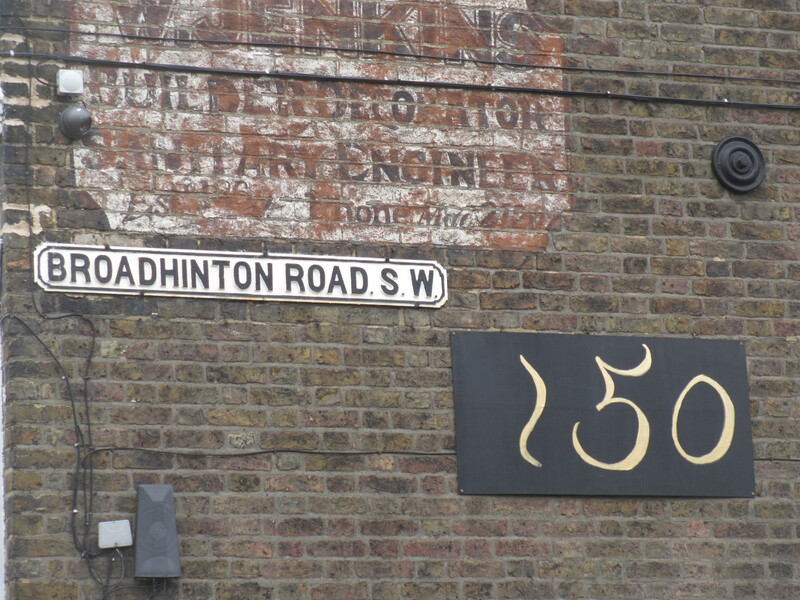 Starting at the Post Office at 161 – 163 Clapham High Street, head south to the junction of Clapham Park Road, where you will see the tube station ahead of you. 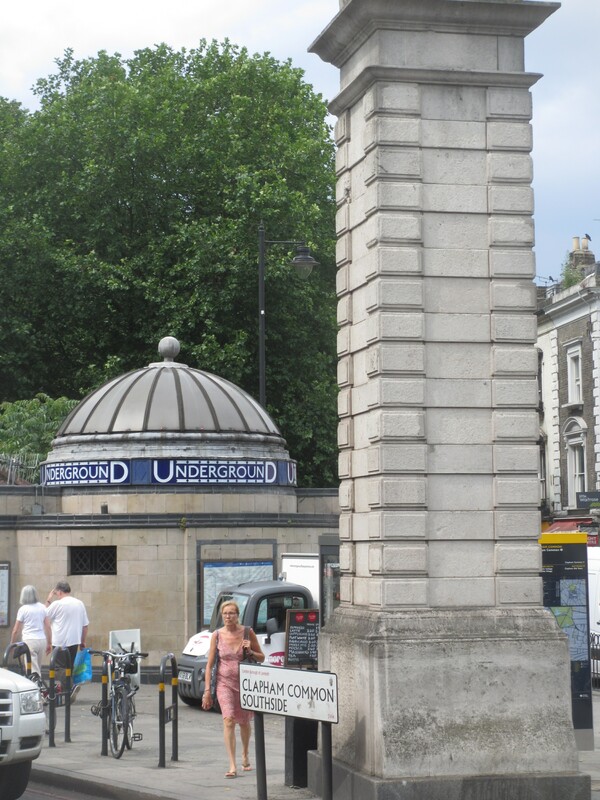 Clapham Common station was the southern terminus of the City and South London Railway (C & SLR) for around 25 years from 1900. The C & SLR was the first deep level underground railway in the world – the initial stretch from the City to Stockwell opened in 1890. No one had done this before and with hindsight the developers might not have done some of the things they did. One of these was building stations with a single narrow platform with trains thundering in on both sides. 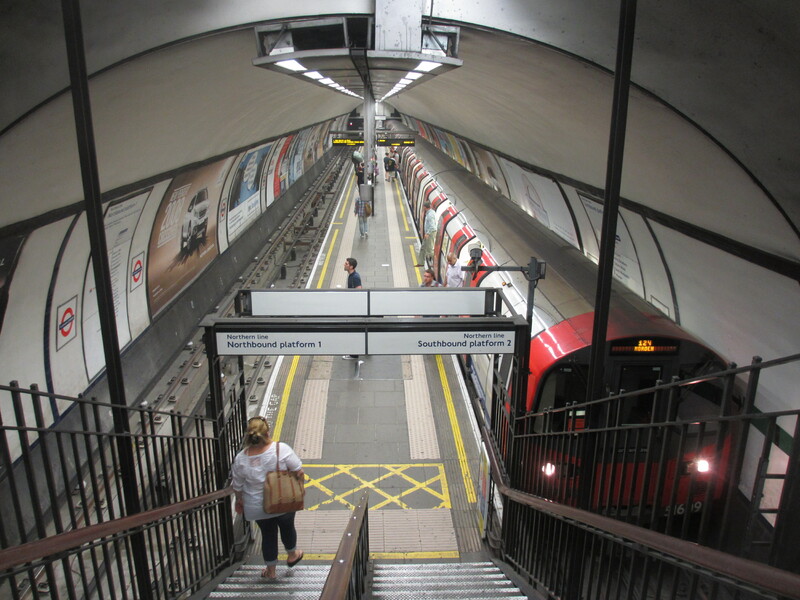 C & SLR did this at four stations when they extended their original line: Angel and Euston in the north and Clapham North and Clapham Common in the south. 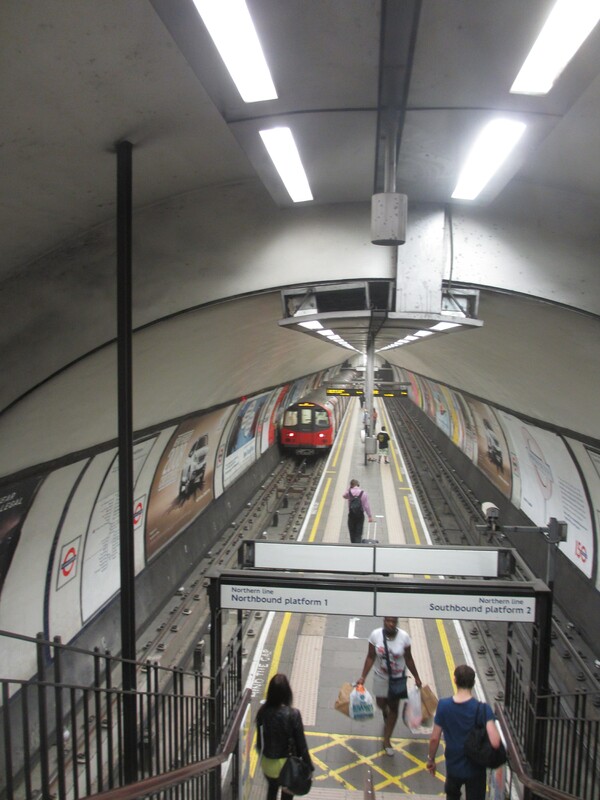 The two northern stations have since been rebuilt but the two Clapham stations retain this odd arrangement which can feel decidedly unsafe when busy. Clapham Common is not quite as originally built because in the 1920s the whole C &SLR was reconstructed to make the tunnels bigger (yes the line was even smaller than the one you see today, another flaw in the original plan – you can see an original C & SLR engine and carriage at the London Transport Museum and actually sit in the carriage to get a feel for how small it was). The present station dates from the 1920s and I suspect that the current ticket hall is not where the original one was. That is because the original had lifts which would have gone straight up from near the end of the platform but today there are escalators installed in the rebuild which take you further south. 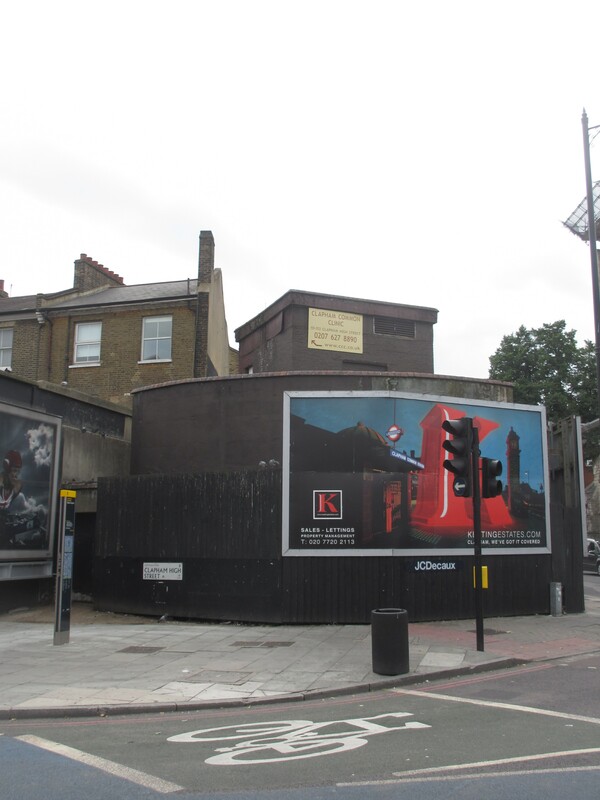 Do take a peek at the dark brown concrete structure behind the hoardings at the corner of Clapham High Street and Clapham Park Road. This was one of a number of sections of deep level tunnels built as shelters during WWII – the idea being that after the war they could be joined up and form an express line to relieve the Northern line. They were never used for this purpose because after the war money was short and it was concluded that it would be better value for money and benefit more people if London Transport built the extra capacity on a new alignment. That eventually led to the Victoria line being built. The tunnels have therefore been mainly used for storage. If you look at numbers 192-194 Clapham High Street on the corner of Venn Street, it looks rather grand with its tall classical façade finished with tiles. This was intended to be the entrance to a large Cinema. In 1910 just around the corner in Venn Street, the Electric Picture Palace had opened, on the site of a former stables. But there were plans to replace this with a magnificent new cinema to be called the Coliseum, with an entrance on the High Street. Surrounding buildings were purchased for expansion. However, the company ran into financial difficulties. Only the entrance on the High Street was built by 1919. The Coliseum Cinema would have had almost 3,000 seats, but it never opened. 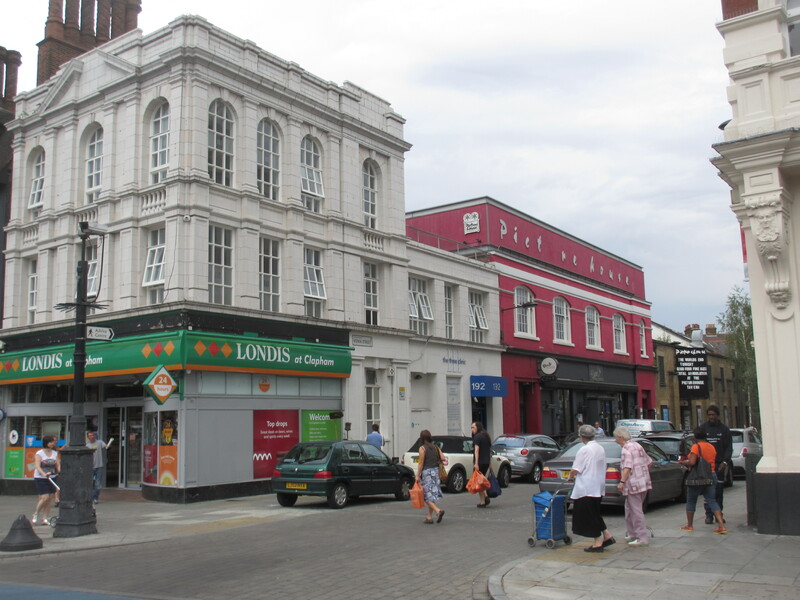 See http://archiseek.com/2013/1919the-coliseum-high-street-clapham-s-w/#.UerEEtLVB8E for how it was to have looked. 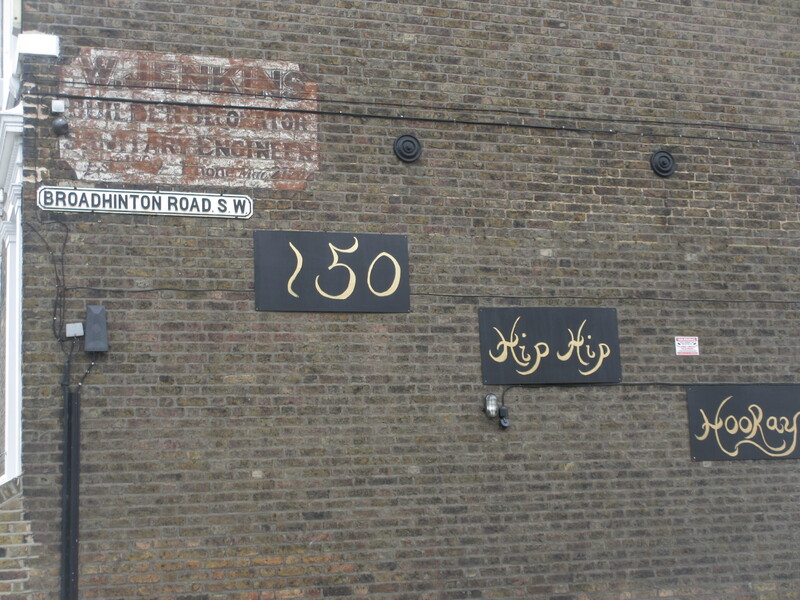 The Venn Street site was turned into a snooker hall and remained so until 1992, when Clapham Picturehouse opened its doors to the public for the first time. In 1998 a fourth screen was added and the cafe-bar was extended. It is the lurid pink building you see in the photo. Go down Venn Street and turn left in Brommells Road. At the end you will find yourself in The Pavement (which by the way is actually a road). Just opposite the Frog pub is a mid 19th century building. This building at number 33 The Pavement is called “The Lodge”. 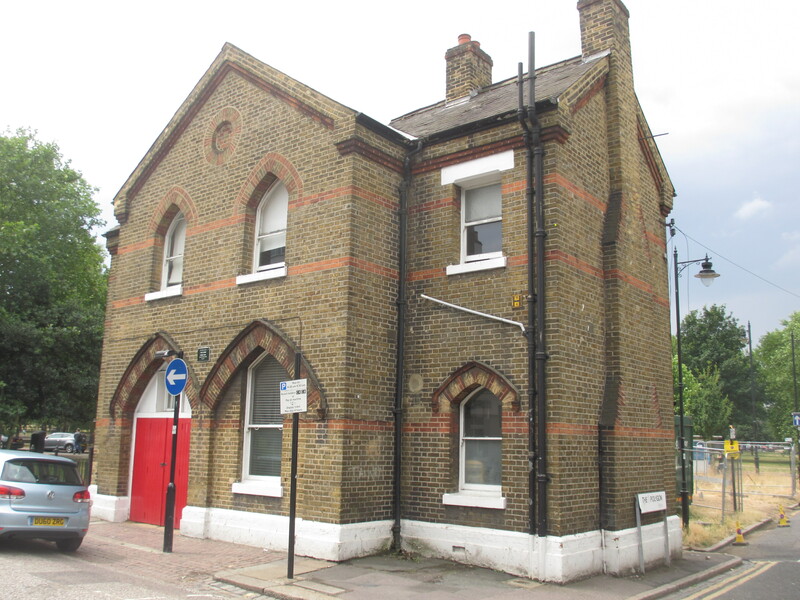 It was built in 1868 as Clapham Fire Station and was used until 1902. The Metropolitan Fire Brigade was formed in 1866 as the first publicly funded fire service for London. Twenty-six new fire stations were built, but as fire appliances became larger and more were required, most of these early stations were demolished or drastically altered to make way for larger ones. Because of its constricted site, the Clapham station was replaced along the road in Old Town, leaving this old building as possibly a unique survivor. 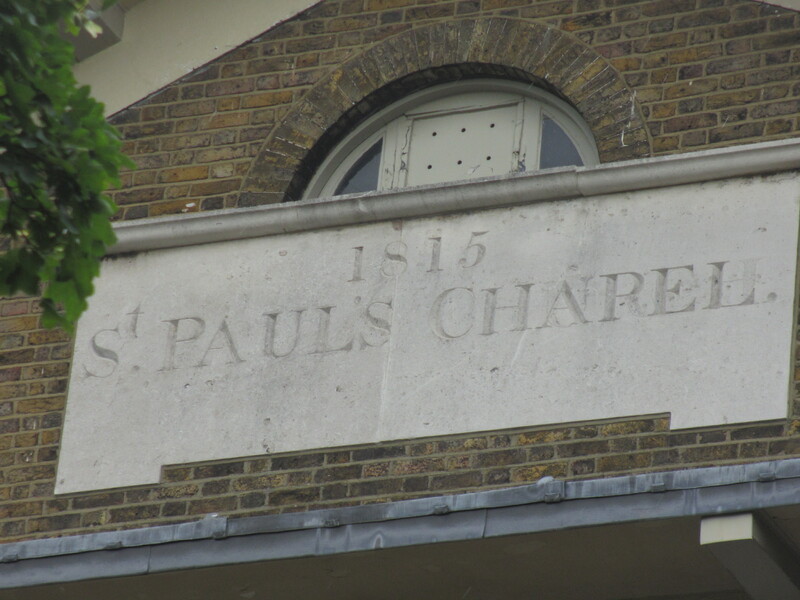 The building now displays one of the Clapham Society’s green plaques. These commemorate the former uses of historic buildings in Clapham. It is the Society’s fourth plaque and was unveiled on 5 June 2013. Keep walking along the Pavement and this widens out and becomes “Old Town” (also a street name). On your left, you will find what architectural historian Pevsner calls “the best houses” in the old village. These houses date from 1707 when Clapham was still a country village. They are really delightful and number 43 in particular has wonderful railings. 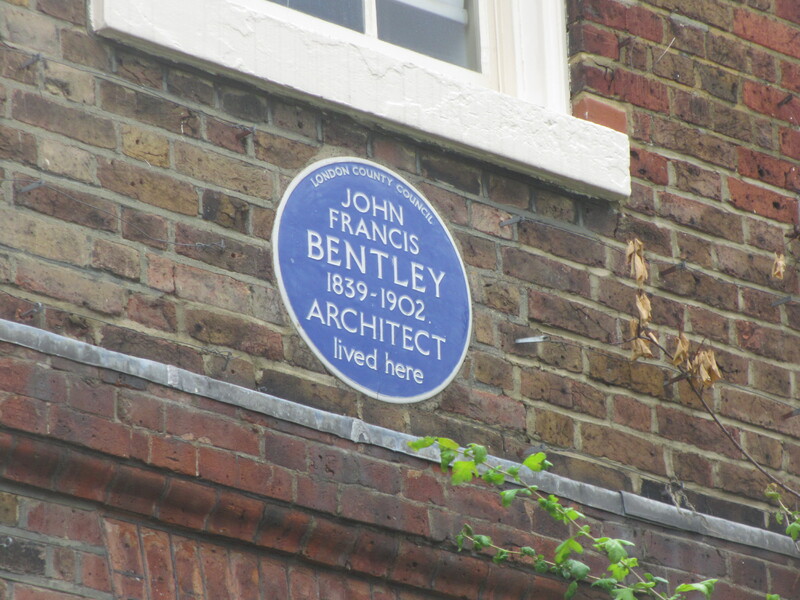 Number 43 also has an architectural connection in that it was the home of John Francis Bentley, whose most famous building is the catholic Westminster Cathedral. Just off of Rectory Grove is a remarkable little L shaped street that time seems to have forgotten. 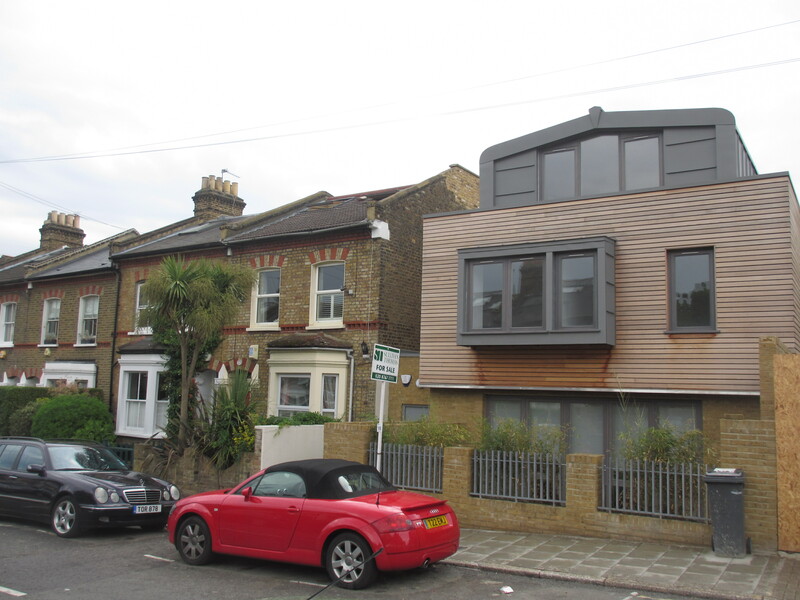 It looks like it was never adopted by the council and has no pavements with the roadway running right up to the tiny terrace houses. 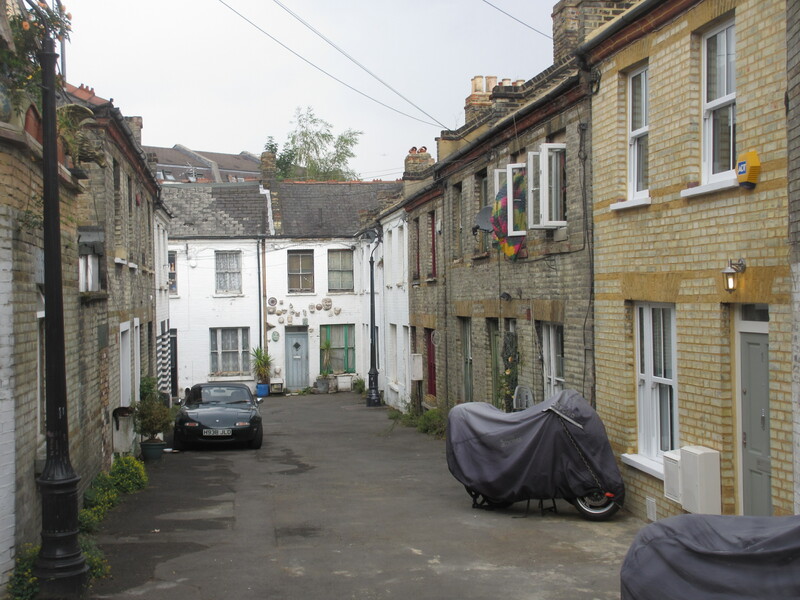 It all looks a bit run down and hard to believe this is 2013 Clapham. 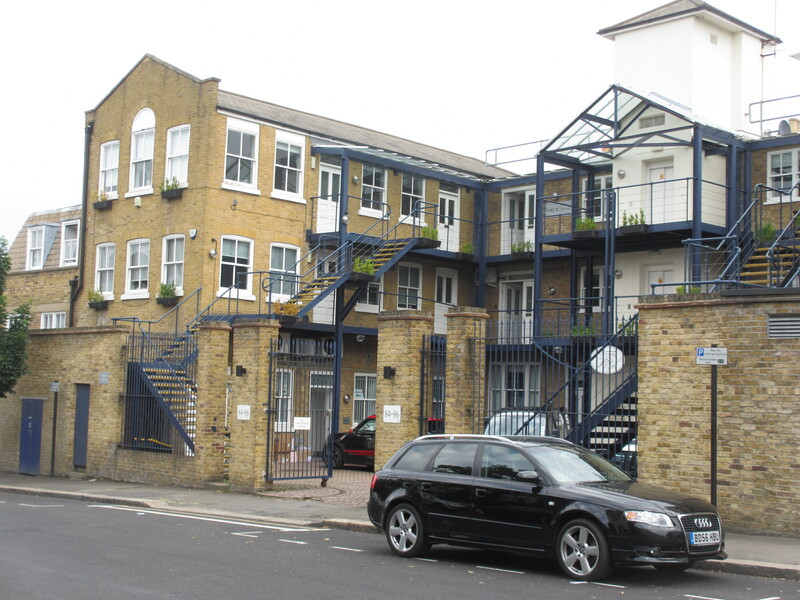 From what I have been able to glean, most if not all of these properties are owned by Lambeth Council – originally squatted they now seem to be on short-term lets. But the Council is in the process of selling them – see the attached links. I suspect that this little piece of history will be gone within a few years. 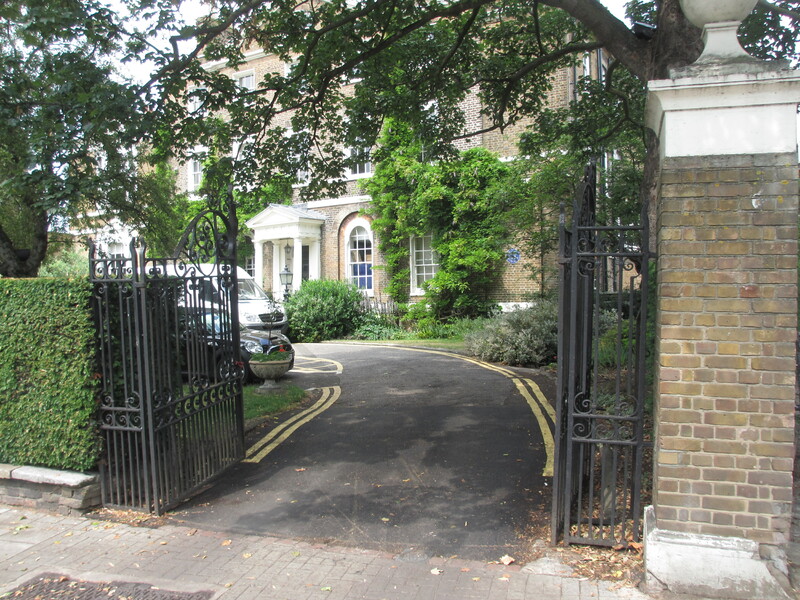 Keep walking down Rectory Grove and after Turret Grove, follow Rectory Grove as it veers off to become a dead-end street to the left. At the end is St Paul’s church. St Paul’s is the site of the original Clapham Parish Church. 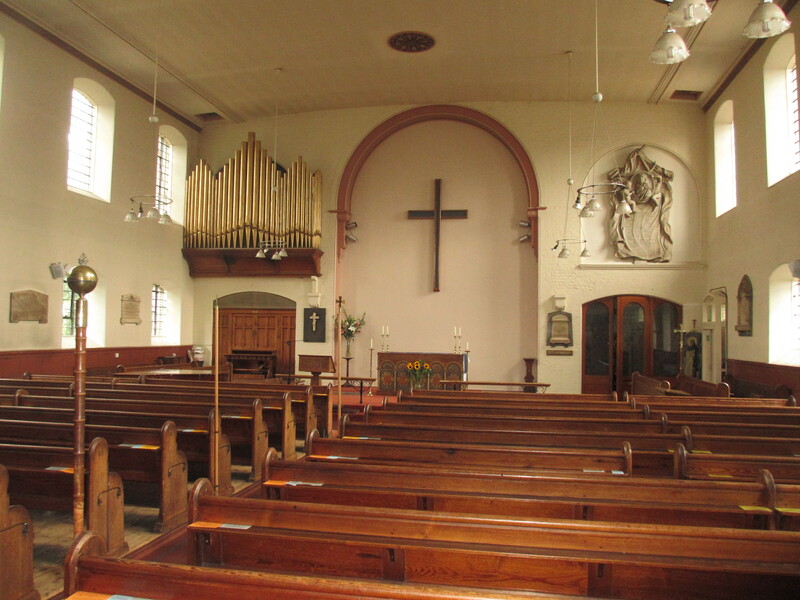 When Holy Trinity was built in the mid 1770s, it ceased to be the parish church. 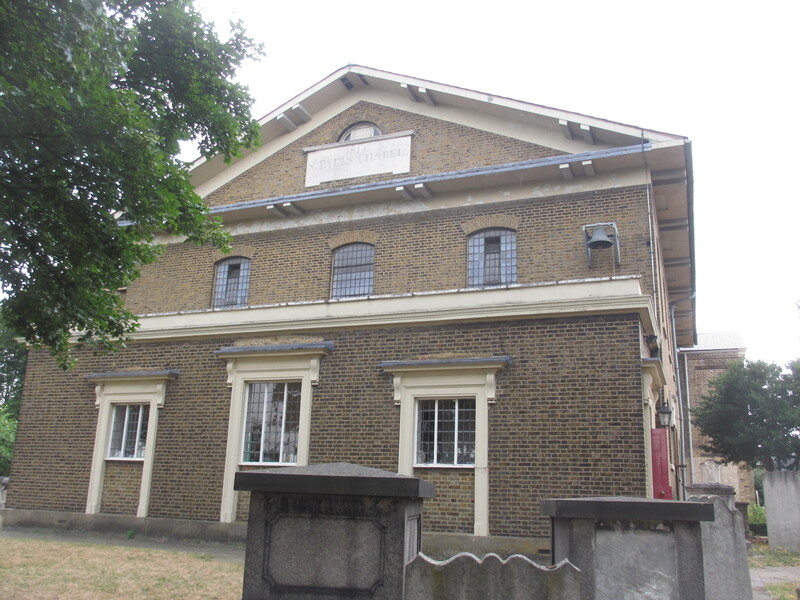 In 1815 the original building was demolished and replaced by the current one, with the status of a chapel of ease. 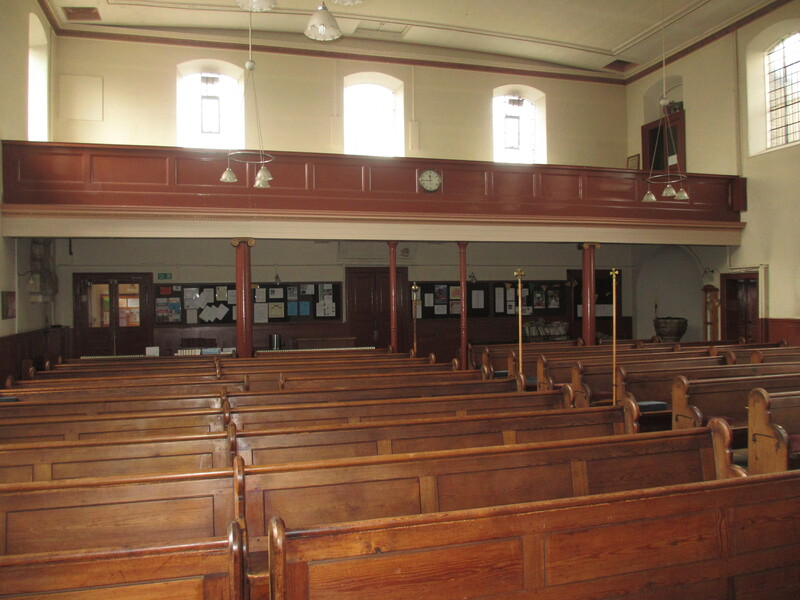 It is a huge brick box added to in the 1870s – this addition has since been sectioned off to form the parish centre. Interestingly some of the monuments from the old church survive including one for William Hewer who died in 1715. He lived in a house on the north side of Clapham Common. He was clerk to diarist Samuel Pepys and in fact Pepys lived at Hewer’s House for the last couple of years of his life, dying there in 1703. 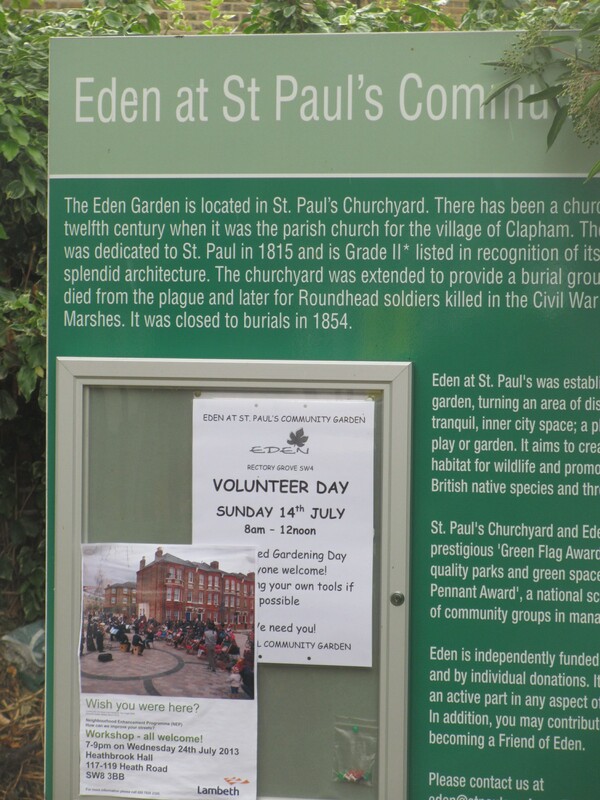 On the righthand side of the church yard is the delightfully named Matrimony Place and off that is a community garden, fittingly called the Eden Garden. 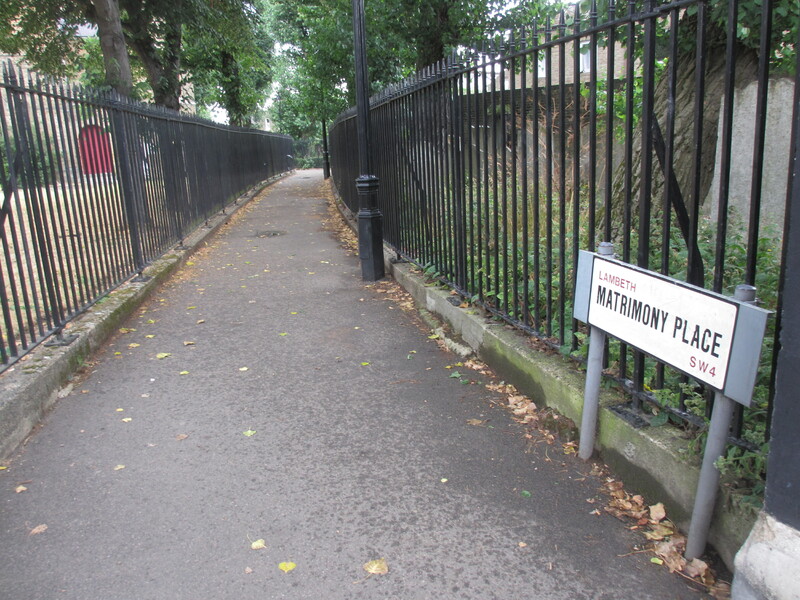 Do not venture down this path as it will lead you out of SW4 and into Wandsworth Road which is SW8 – and that would never do on our SW4 walk. 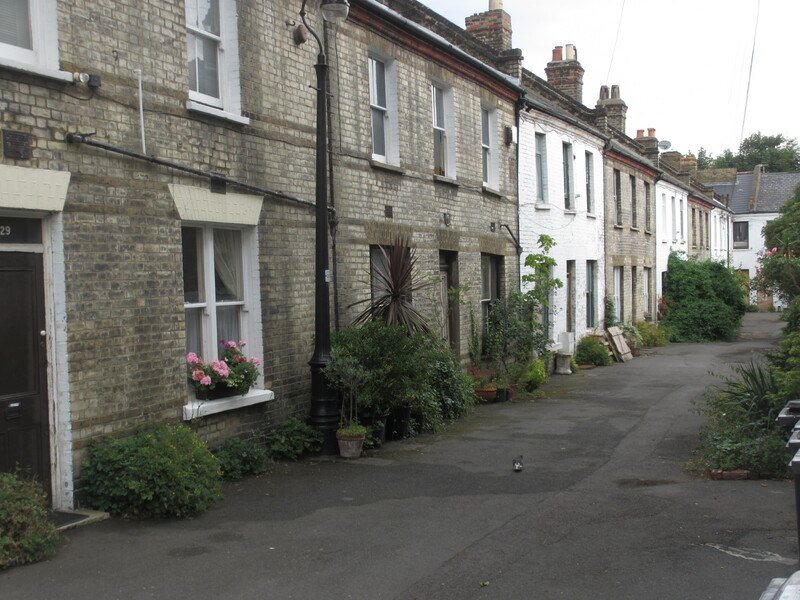 A bit of research revealed that on 8 June 2013 the residents of Broadhinton Road held a street party to celebrate the street’s 150th birthday. 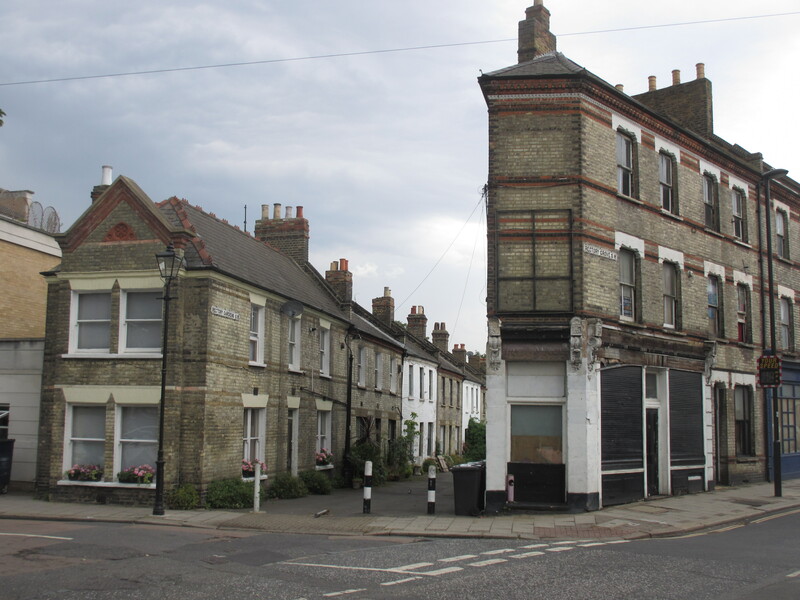 Broadhinton Road was (mostly) built in 1863 and its name is said to come from the Wiltshire village of Broad Hinton where the owner and developer of the land, a Mr Frederick Hewitt, met his wife Elizabeth in the 1820s. By the way note the street sign. This has just the SW and no number, so presuambly predates the First World War. They are quite common in SW London, as the Councils have not systematically replaced the street signs as has happened in other boroughs. Go to the end of Broadhinton Road crossing Lambourn Road and continuing into Hannington Road. 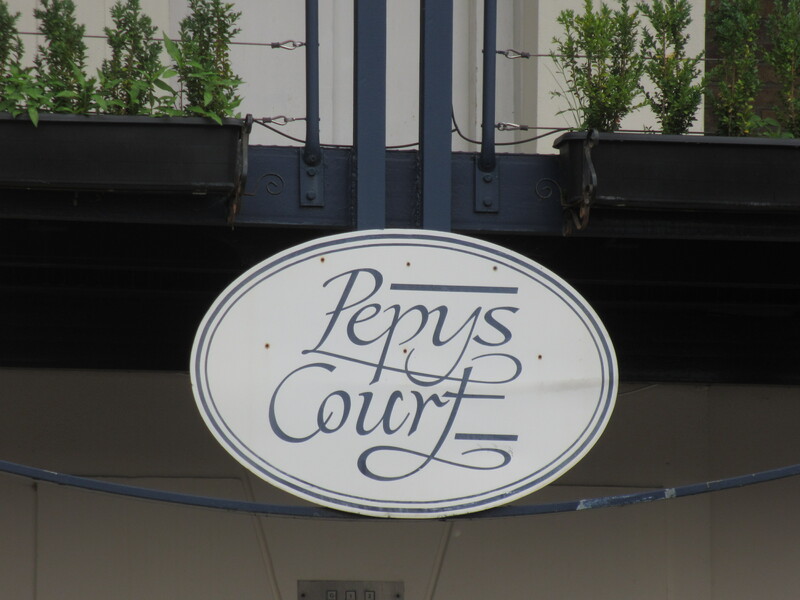 At the end you reach The Chase, take a short detour to your right where you will find Pepys Court. 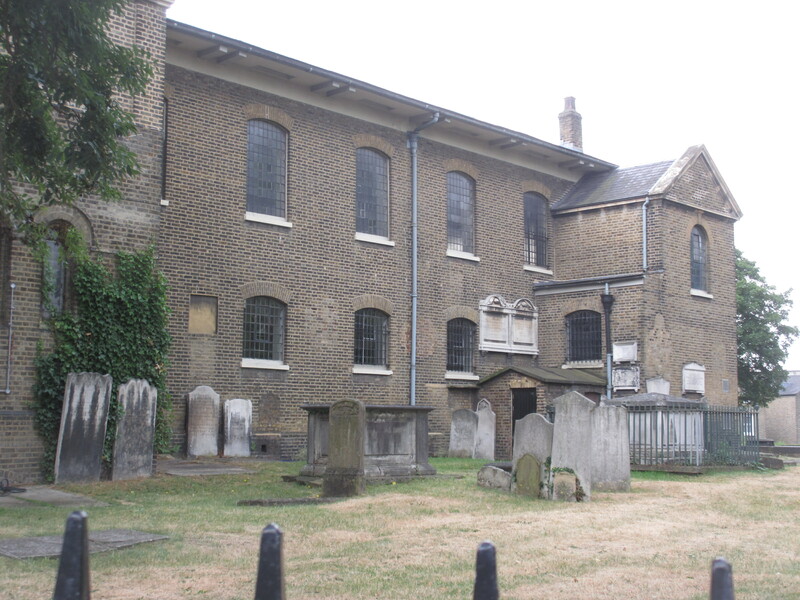 Now as we have heard Samuel Pepys lived out his last years with William Hewer in Clapham. I can find no evidence to suggest that this industrial looking building has anything to do with the Pepys legacy but who knows! But outside is a little plaque which I thought might tell me something about the building’s history. 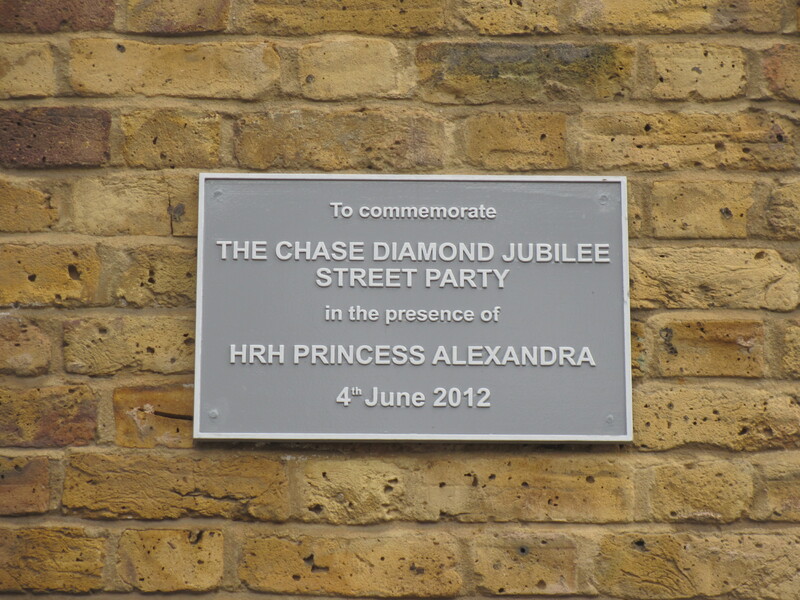 But no – this plaque is to commemorate the street party held for the 2012 Diamond Jubilee in The Chase. 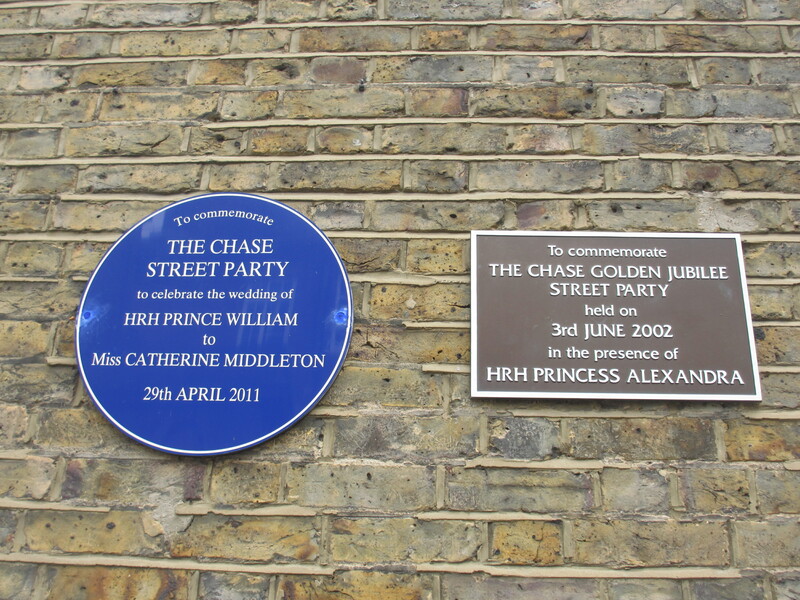 Just near the common end of The Chase on the left hand side are another two plaques which commemorate more street parties: one for the 2002 Golden Jubilee and the other (a mock blue plaque) for the 2011 marriage of Wills and Kate. Well Clapham may be said to be a party place but this was not quite what I had imagined. When you reach the end look at the building to your right set back on the corner of The Chase and Clapham Common North Side. Just at this corner is a large Victorian house, which was originally called the Elms. 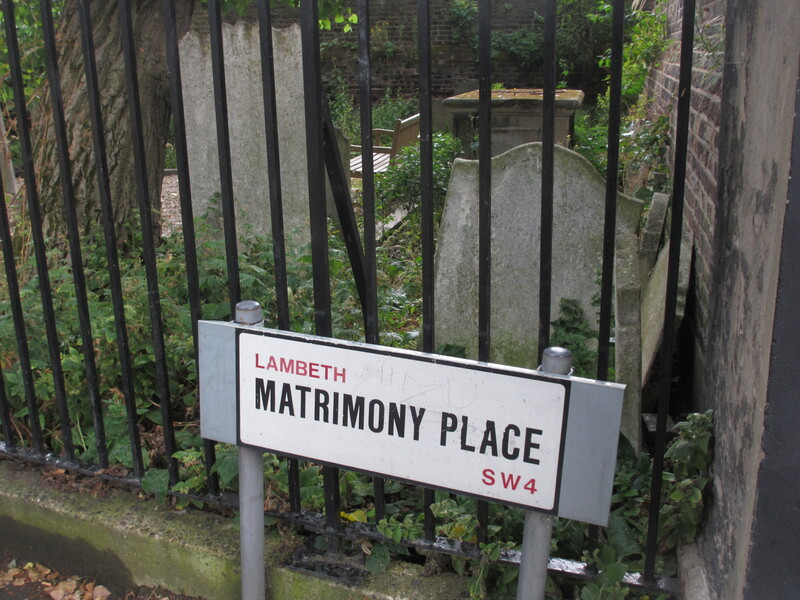 This is where architect Sir Charles Barry lived and died. It now forms part of Trinity Hospice premises. 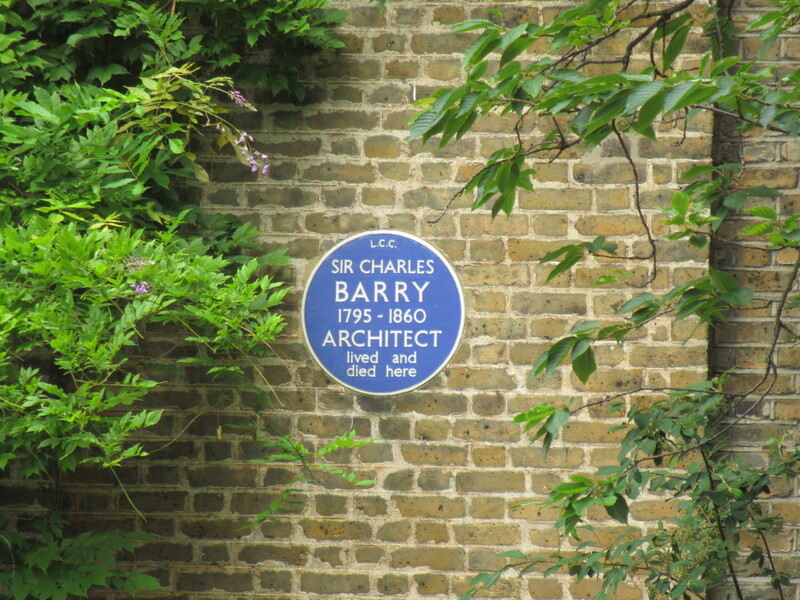 Barry was a great proponent of Italianate architecture in Britain. But his most famous work is the Houses of Parliament which is in gothic style. No doubt if he had had the choice he would have designed an Italianate Houses of Parliament but that was not the commission. Barry famously did not design the interiors of the Houses of Parliament; that was Augustus Welby Northmore Pugin. Pevsner sums it up nicely by saying “The secret of the undoubted architectural success of the Houses of Parliament lies in this collaboration of two utterly different men and in the union of two utterly different views.” It is said Barry favoured regularity and symmetry whilst Pugin belived in functional asymmetry. Return along Clapham Common North Side (as if you had turned left out of The Chase) and follow it as it sweeps away from the main part of the Common. On the way to our next stop we pass two blue plaques. 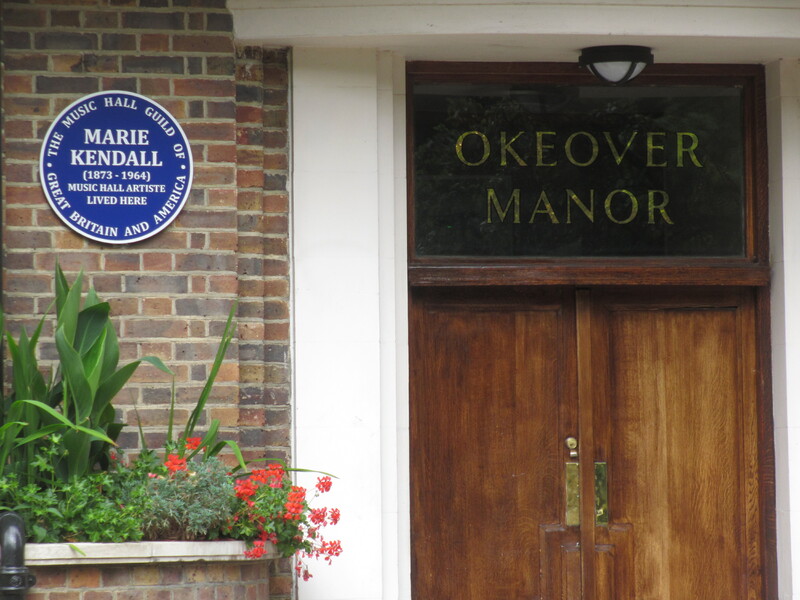 One at a block of flats (Okeover Manor) is for the music hall star, Marie Kendall (1873 – 1964) put there by the Music Hall Guild of Great Britain and America. 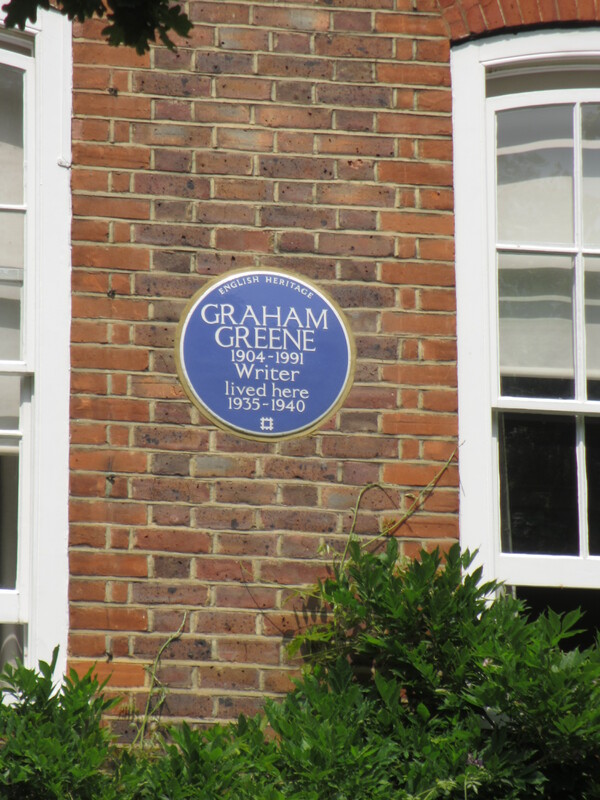 The other is an English Heritage blue plaque at 14 Clapham Common North Side, the home of novelist Graham Greene from 1935 to 1940. 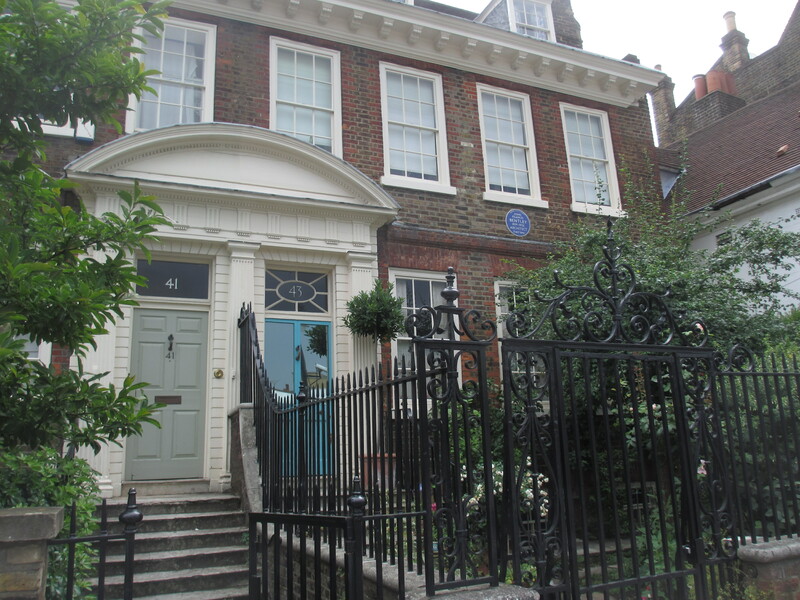 The house was seriously damaged by a bomb in October 1940, but it was unoccupied on that night as Greene was staying with his lover in Bloomsbury. The shell of the house survived and the interior was rebuilt after the war. The incident was used by Greene in his novel, The End of the Affair. Cross over the road and head towards the church on the Common and go in the left hand gate. 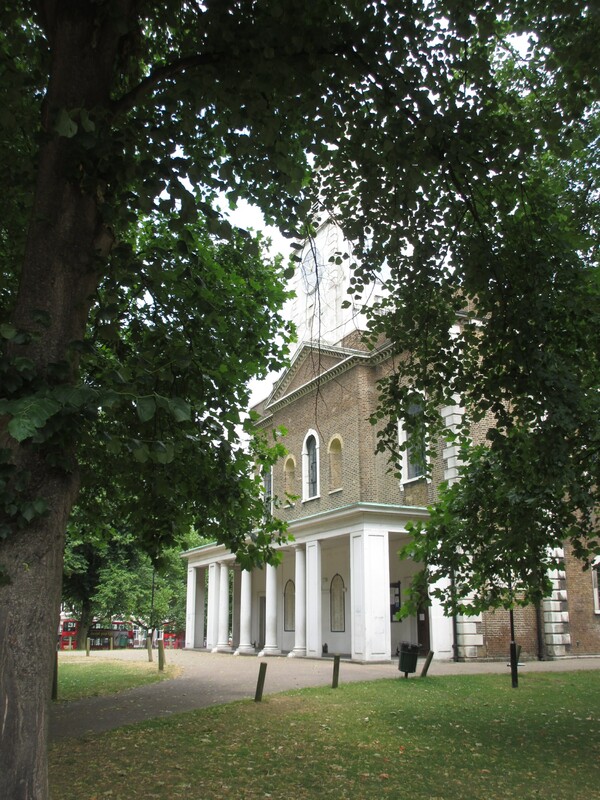 This church replaced St Paul’s as parish church in the mid 1770s as the area round the common developed in the late 18th century and the first part of the 19th century. The group published a journal, the Christian Observer, edited by Zachary Macaulay and they have been credited with the foundation of several missionary societies, including the British and Foreign Bible Society and the Church Missionary Society. Their efforts were eventually rewarded with the passing of the Slave Trade Act in 1807, banning the trade throughout the British Empire and then the total emancipation of British slaves with the Slavery Abolition Act in 1833. 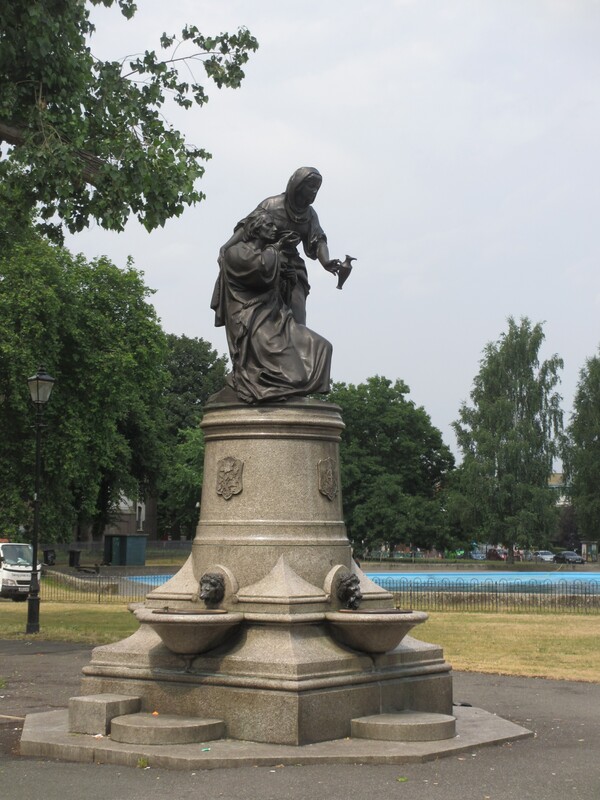 The Clapham Sect have been credited with playing a significant part in the development of Victorian morality, through their writings, their societies, their influence in Parliament, and their philanthropy and moral campaigns, especially against slavery. Interestingly the man on the Clapham Omnibus seems to have nothing to do with any of this, so I guess he is just reasonable – not moral. 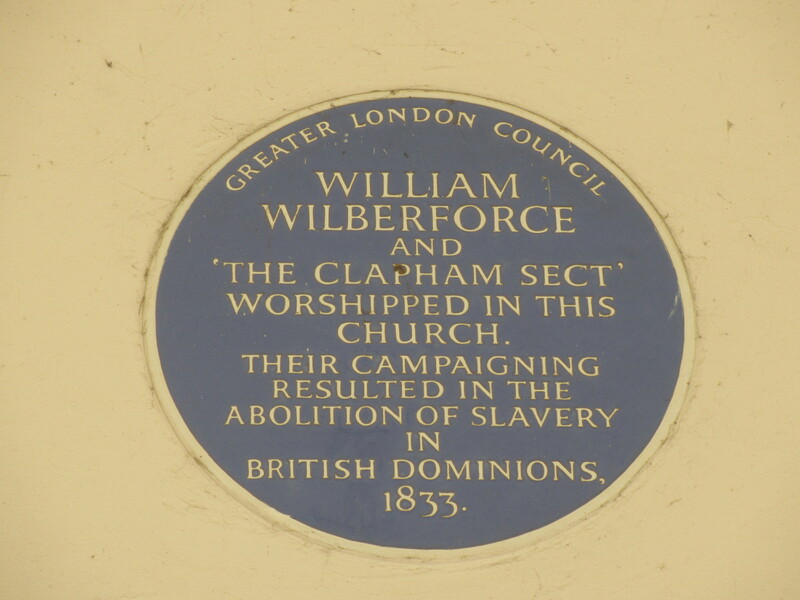 There is an English Heritage blue plaque in the porch at the front of the church dedicated to William Wilberforce and other members of the Clapham Sect. 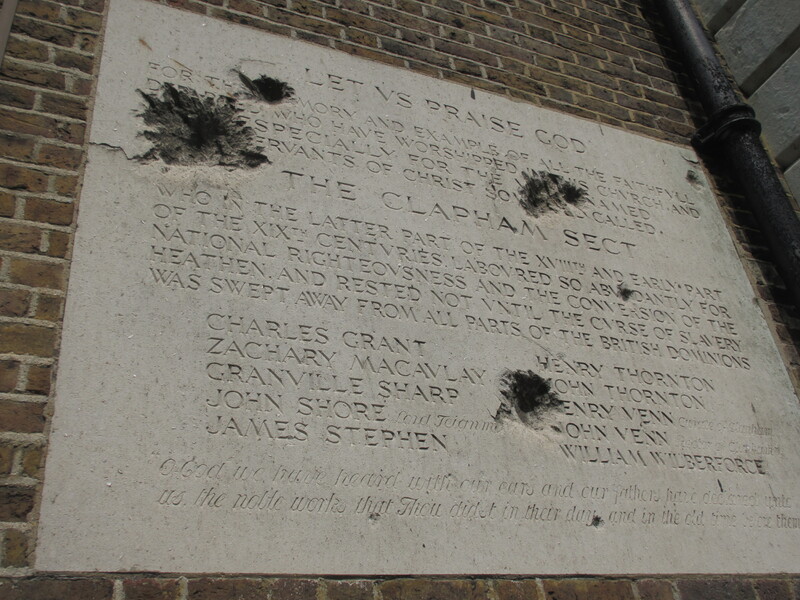 Just around the corner on the south side of the building is a further (bomb damaged) plaque which commemorates ten of the Clapham sect members by name. Leave the fenced area of the church by the other gate. And just a little way along is a drinking fountain and on top there is this statue of a woman giving some water to an old man. Originally located at London Bridge in 1884 it was moved here in 1895. 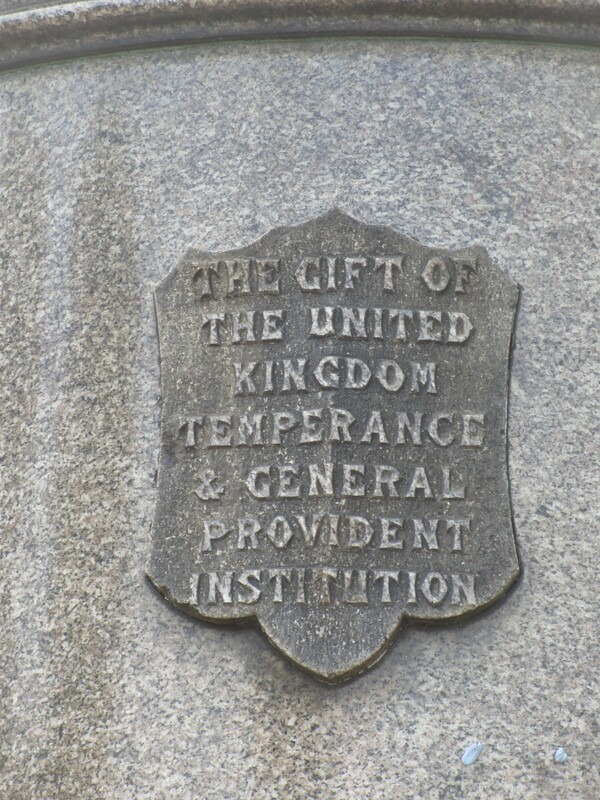 This was a gift from the United Kingdom Temperance and General Provident Institution, no doubt to promote the drinking of good old water. And what do we see at the foot of the statue, another gift. 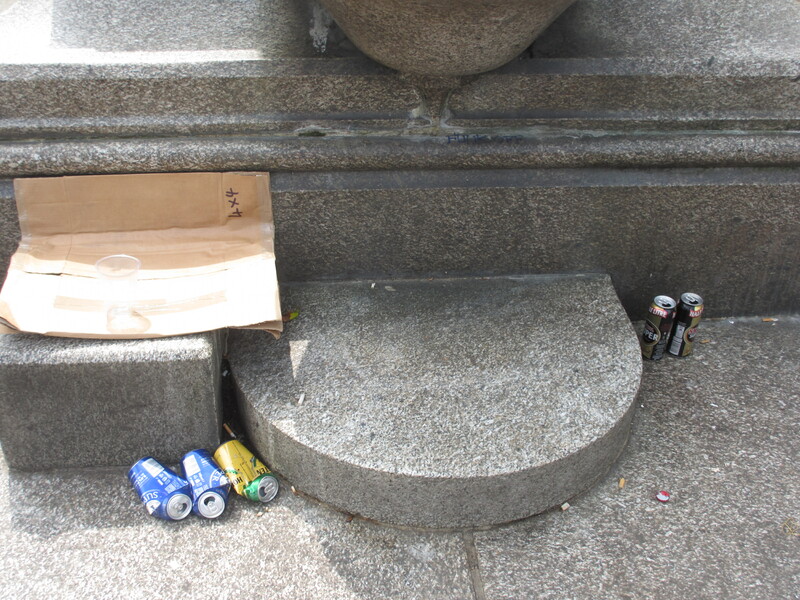 Five (empty) cans of lager and some cardboard – maybe a gift from the street drinkers of Clapham? Keep on walking towards the buildings and ahead is the sweep of The Pavement. 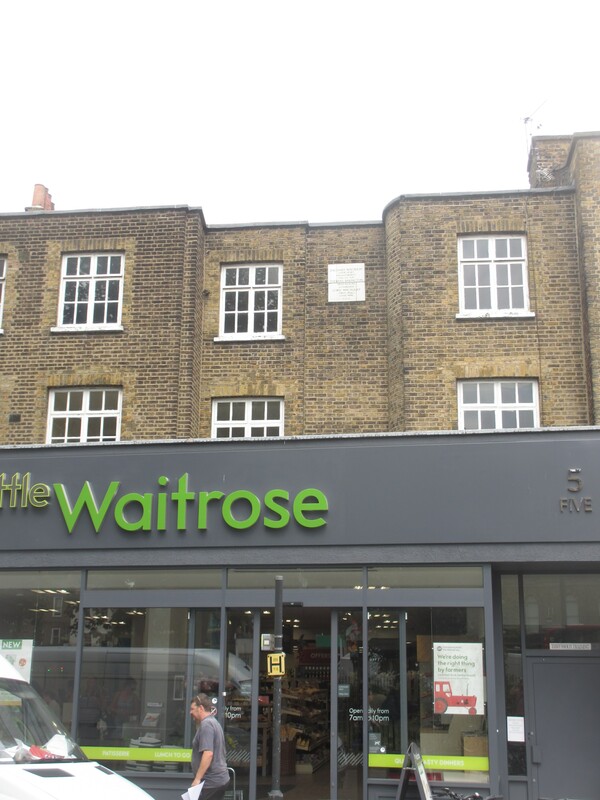 On the Pavement, just before you get back to the Tube station, you will see a Little Waitrose. 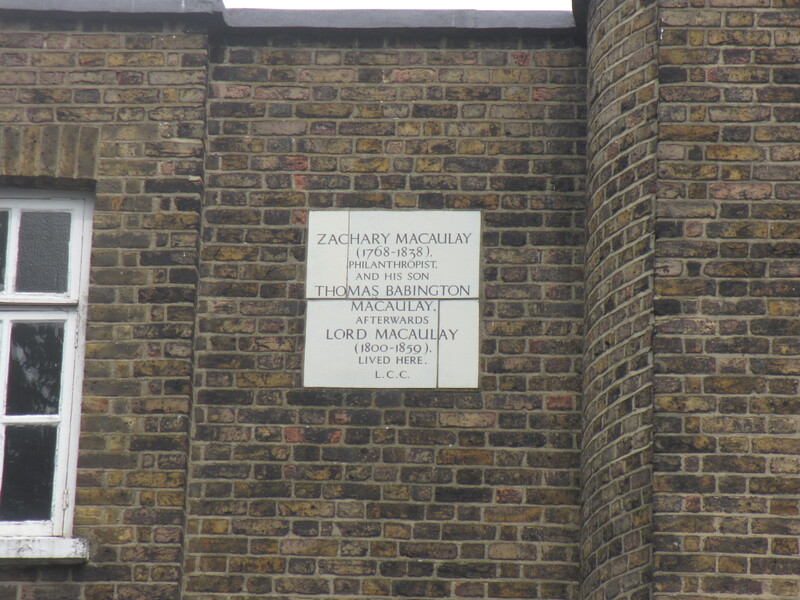 Only from across the street can you see a stone plaque at second floor window level, which says this is where Zachary Macaulay (of the Clapham Sect) and his son, Thomas Babington Macaulay, lived. The world has certainly changed since the Macaulays lived here. Just by way of an aside. you will no doubt know that the telephone numbers in London used to be in the format of three letters and four numbers with the three letters being the start of a name. Clapham fittingly was MACaulay. This translated to 622 and then with the move to 8 digit numbers became 7622, which is still one of the local exchange numbers in use today for Clapham. Today we have seen how it does not always pay to be first in your innovation (the tube station); a cinema that never was, a fire station that used to be, the homes of architects of two of the most distinctive buildings in Westminster, two churches (one of which played a major role in the abolition of slavery), plus some street party locations. You are now back at Clapham Common tube station with its many options for eating and drinking and onwards travel.